August 20, 2009, NASA has completed a two-day review of space shuttle Discovery's readiness for flight and selected Aug. 25 as the official launch date for the STS-128 mission to the International Space Station. Liftoff is scheduled for 1:36 a.m. EDT from NASA's Kennedy Space Center in Florida. Discovery's launch date was announced after a flight readiness review at Kennedy. During the meeting, senior NASA and contractor managers assessed the risks associated with the mission and determined the shuttle's equipment, support systems and procedures are ready for launch pending the resolution of one remaining issue. An orbiter power controller that failed to operate properly was replaced, and an analysis was completed. The issue is expected to be closed when final data from the analysis is presented at the mission management team meeting on Aug. 23. The readiness review included a thorough discussion about foam insulation that covers the shuttle's external fuel tank. The foam helps prevent ice from developing when super-cold propellants are loaded prior to launch. During shuttle Endeavour's liftoff on July 15, foam separated from the intertank area and the liquid oxygen tank's ice frost ramps. The foam loss led to a detailed examination that determined Discovery is acceptable to fly. "There was an excellent discussion on foam loss that included input from multiple teams including our NASA safety and engineering communities," said Bill Gerstenmaier, associate administrator for Space Operations at NASA Headquarters in Washington, who chaired the day and a half meeting. "After examining the foam releases on recent flights and completing a lot of testing and analysis to improve our understanding of the relative risks, we concluded that we're ready to go fly. The teams are continuing to learn about foam and have planned additional tests and analysis to continue to improve our understanding of foam loss mechanisms and risks." The 13-day flight will deliver science and storage racks, a freezer to store research samples, a new sleeping compartment, an air purification system and a treadmill named after comedian Stephen Colbert. The name Colbert received the most entries in NASA's online poll to name the station's Node 3. NASA named the node Tranquility. Astronaut Rick Sturckow will command Discovery. He will be joined by Pilot Kevin Ford and Mission Specialists Pat Forrester, Jose Hernandez, Danny Olivas and European Space Agency astronaut Christer Fuglesang. 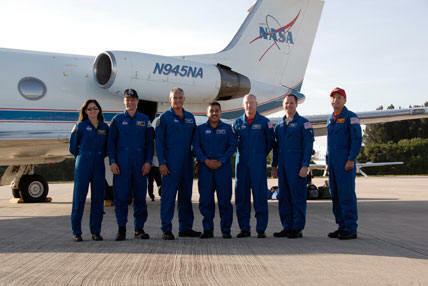 NASA astronaut Nicole Stott will fly to the complex aboard Discovery to begin a three-month mission as a station resident. She replaces NASA's Tim Kopra, who will return home on Discovery. STS-128 will be Discovery's 37th mission and the 30th shuttle flight dedicated to station assembly and maintenance.